11 A None No Power Seat 11 A is a standard Economy Class seat located in an Exit Row. 11 C None No Power Seat 11 C is a standard Economy Class seat located in an Exit Row. 11 D None No Power Seat 11 D is a standard Economy Class seat located in an Exit Row. 11 F None No Power Seat 11 F is a standard Economy Class seat located in an Exit Row. 13 A None No Power Seat 13 A is a standard Economy Class seat, although proximity to the galley may be bothersome. 13 C None No Power Seat 13 C is a standard Economy Class seat, although proximity to the galley may be bothersome. 13 D None No Power Seat 13 D is a standard Economy Class seat, although proximity to the galley may be bothersome. 13 F None No Power Seat 13 F is a standard Economy Class seat, although proximity to the galley may be bothersome. 2 A None No Power Seat 2 A is a standard Economy Class seat at the bulkhead. The seat may be classified and selected on certain flights as Main Cabin Extra featuring slightly more legroom plus preferred boarding. There is no floor storage for this seat during takeoff and landing. 2 C None No Power Seat 2 C is a standard Economy Class seat at the bulkhead. The seat may be classified and selected on certain flights as Main Cabin Extra featuring slightly more legroom plus preferred boarding. There is no floor storage for this seat during takeoff and landing. The flight attendant's jump seat faces you. 2 D None No Power Seat 2 D is a standard Economy Class seat at the bulkhead. The seat may be classified and selected on certain flights as Main Cabin Extra featuring slightly more legroom plus preferred boarding. There is no floor storage for this seat during takeoff and landing. 2 F None No Power Seat 2 F is a standard Economy Class seat at the bulkhead. The seat may be classified and selected on certain flights as Main Cabin Extra featuring slightly more legroom plus preferred boarding. There is no floor storage for this seat during takeoff and landing. This aircraft is operated by Piedmont Airlines on behalf of American Airlines. None of the seats on this aircraft recline, overhead storage is limited and there is no entertainment onboard. Also, some users have reported that this aircraft is expecially noisy due to the configuration of the engine and propellers. 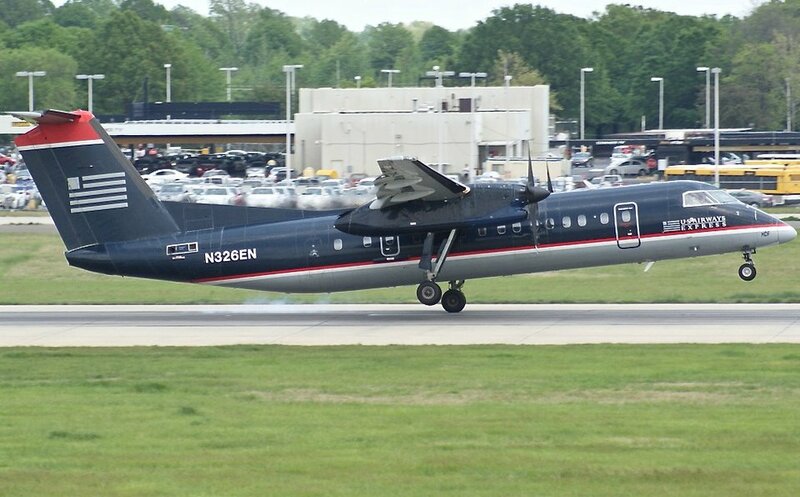 The Dash 8 300's are very noisy and vibrate terribly. Bring your earplugs! Also, seats near the front of the plane are close to the lavatory which gives off port-a-potty smells. This turboprop is a little louder than most jets, but other than that, seats are decent for a regional flight. View out the window is good in most seats due to the overhead wings. American Airlines flies 1 versions of Dash 8-300.